Spirulina – contains vitamin E, selenium and tyrosine, which are all known for their powerful anti-aging effects. The antioxidants present in tyrosine eliminate free radicals and slow down the aging of skin cells. 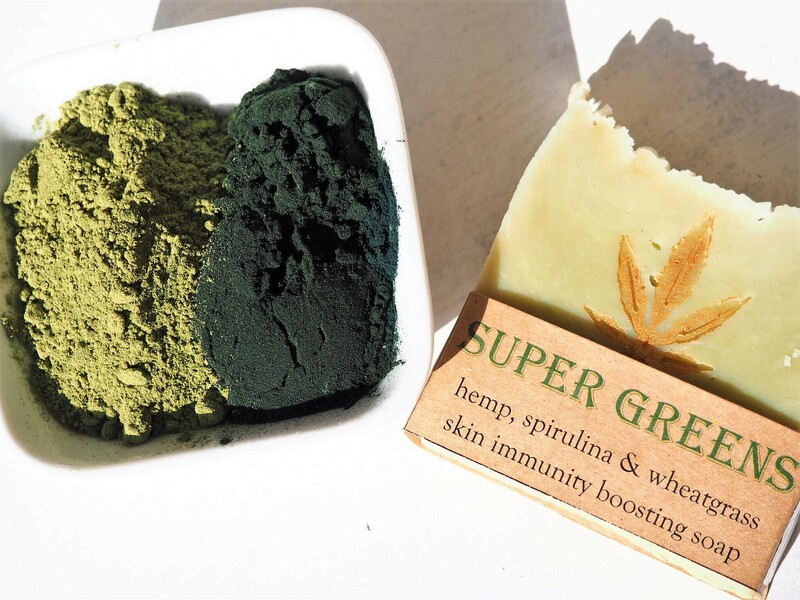 Organic wheat grass – known as a Super food for its many benefits to health, it is high in anti-oxidant and nutrients which helps to build immunity and help arthritis and joint inflammation, has natural antibacterial and antimicrobial and anti-cancer properties; known to also effectively treat Psoriasis, Acne, Dry skin, Body Odour. Hemp Oil – Hemp seeds are rich in protein, polyunsaturated fatty acids, omega 6, omega 3 and insoluble fiber. They are a good source of tocopherols or Vitamin E antioxidants. … High in essential fatty acids, Omega 6 and omega 3, hemp oil can be used to increase immunity, counteract aging skin and improve cardiovascular health. So it is a wonderful oil to put on your skin and consume.